This is amazing! My friend Stacie at preschool is a great cook. I don't think she has brought one thing to preschool that I haven't loved. 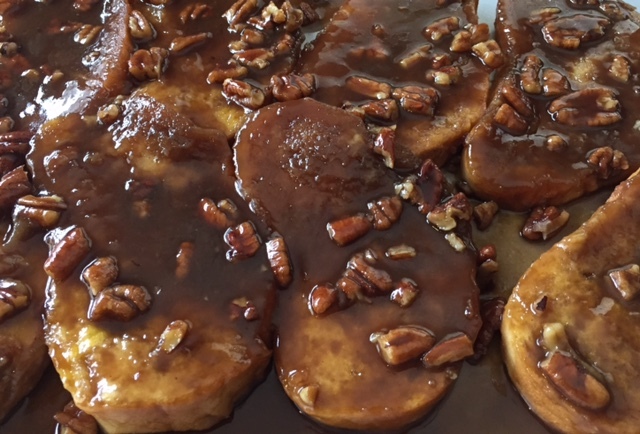 She often makes this Baked Caramel French Toast for a large crowd. She will use a thinner Italian loaf and she stands the slices up so she can get a lot in a pan. That works great for a crowd. She also mentioned that she has topped it with cooked bacon crumbles or cooked sausage crumbles - before baking. Yum! I used French bread so I had pretty big slices. 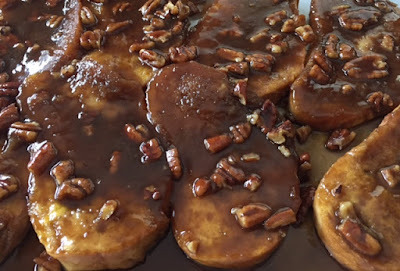 I love pecans so I made one pan with pecans and one pan without... so I doubled the recipe... making two pans of sauce too. My girls favorite part was that the bread was crunchy on one side and then nice caramel was on the other side. One other side note... one of my pans was on a darker metal an one was a lighter colored metal. I definitely liked the texture of the caramel from the recipe in the lighter colored pan - not quite as chewy! I should probably have used a glass pan like the recipe suggested! Beat eggs in a shallow bowl. Add milk, vanilla and salt - beating well. Dip each bread slice in egg mixture - making sure to absorb all egg mixture. Place bread slices over Topping in sprayed baking dish. Cover and refrigerate 8 hours or overnight.